Bisected by a meandering section of the Little Truckee River, the remote, snow-covered Perazzo Meadows property was in imminent danger of being sold to developers until TPL and its partner, the Truckee Donner Land Trust, purchased it in 2009. Perazzo Meadows is home to numerous rare species, including willow flycatchers, peregrine falcons, bald and golden eagles and the mountain yellow-legged frog. Native Lahontan cutthroat trout have disappeared from the tributary that meanders through the large, wet valley, but efforts are underway to reintroduce the threatened fish as part of a major restoration project. 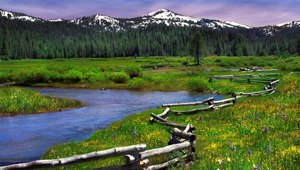 The protection of Perazzo Meadows is part of TPL's broader plan to permanently protect 200,000 acres of private checkerboard property in the region, which stretches from South Lake Tahoe to Lassen Volcanic National Park.